Greer's OC | The Hello Kitty Cafe Pops Up! The Hello Kitty Cafe Pops Up! The Irvine Spectrum Center is now home t​o the first Hello Kitty Café in the U.S.! The pop-up shop style cafe serves many of the same items that were being offered by the popular Hello Kitty food truck, but with the convenience of a regular cafe. The items are all colorful, Hello Kitty themed, and gourmet quality. The espresso drinks feature Portola Coffee Lab coffee and boast an adorable Hello Kitty cocoa portrait in the foam. Some signature drinks include strawberry mint lemonade, passion fruit iced tea, and peach iced tea. 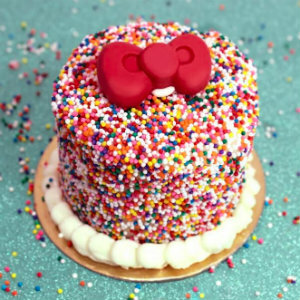 They also offer hot drinks such as lattes and hot chocolate that pair perfectly with a limited number of pastries, cookies, and bite-sized cakes topped with Hello Kitty's signature red bow. Everything offered, including the shop itself, is doused in pink and white hues giving a playful atmosphere to the cafe. It's worth a visit just to witness the charm of the cafe, which is only enhanced by the charm of everything offered. Open 11 a.m. to 9 p.m. Monday through Thursday; 11 a.m. to 10 p.m. Friday; 10 a.m. to 10 p.m. Saturday; 10 a.m. to 9 p.m. Sunday. Irvine Spectrum Center is at 670 Spectrum Center Drive in Irvine.